IMPORTANT! Owners of ConceptDraw OFFICE vv2-4 , please read this before updating your products. See chart below for product version descriptions. With the introduction of version 5, ConceptDraw OFFICE has been redesigned to better accommodate future developments and solution plugins. ConceptDraw OFFICE 5 includes ConceptDraw DIAGRAM 12, ConceptDraw MINDMAP 10, and ConceptDraw PROJECT 9. All products making up ConceptDraw OFFICE 5 feature the renewed graphical user interface for macOS and Windows. New OFFICE 5 suite includes a major update to each of the three of ConceptDraw products, enhancing each individual component, as well as the integration between all three. 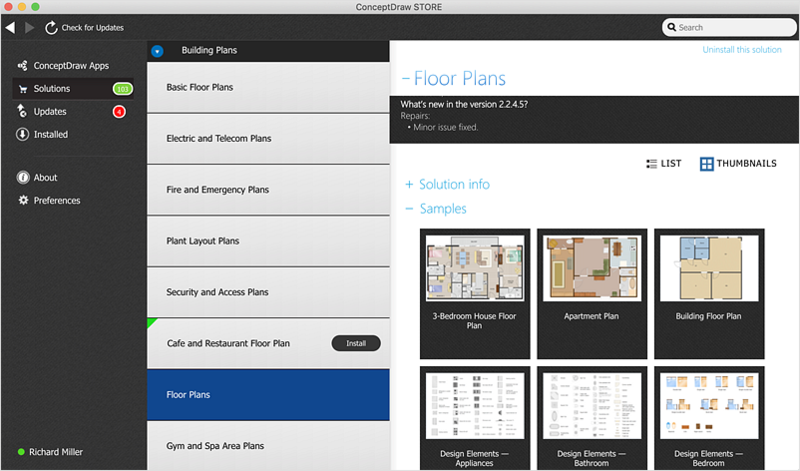 The ConceptDraw STORE provides you with access to content related to all ConceptDraw products and notifies you of new solutions and updates available for download. The new ConceptDraw OFFICE 5 installation process will completely remove previous ConceptDraw OFFICE* installations. Note: If the destination folder has been changed, we advice you to move all the ConceptDraw related documents into the My ConceptDraw folder for better safety. ConceptDraw STORE helps users easily locate and open templates, libraries and sample documents created with ConceptDraw applications.